We can't give you the exotic, adventurous life of a pirate on the high seas, but we can offer the next best thing - the awesome "Dead Men Tell No Tales" Wall Art! Dripping with swashbuckling charm and macabre romanticism, this striking wall mounted resin sculpture depicts a ghostly buccaneer. Like countless other pirates in his day, he was done in by boozing, womanizing, robbing and violence. But it's exactly these pastimes that he continues to long for and lust over - so feverishly, in fact, that even in death he just can't walk away from his high seas marauding lifestyle. His flesh may be long gone, but pirating lingers in his bones - as you can clearly see in this exquisitely detailed wall piece. The skeletal pirate dons his signature pirate hat, featuring the iconic jolly roger - aka skull and crossbones - front and center. Despite his earthly eyes being lost to the worms and the sands of time, he still wears a black leather eye patch over his right eye socket. Perhaps he's become accustomed to aiming with minimal depth perception when shooting his cherished pair of flintlock pistols - both of which he clutches with his bony bejeweled fingers in this cool hanging sculpture. 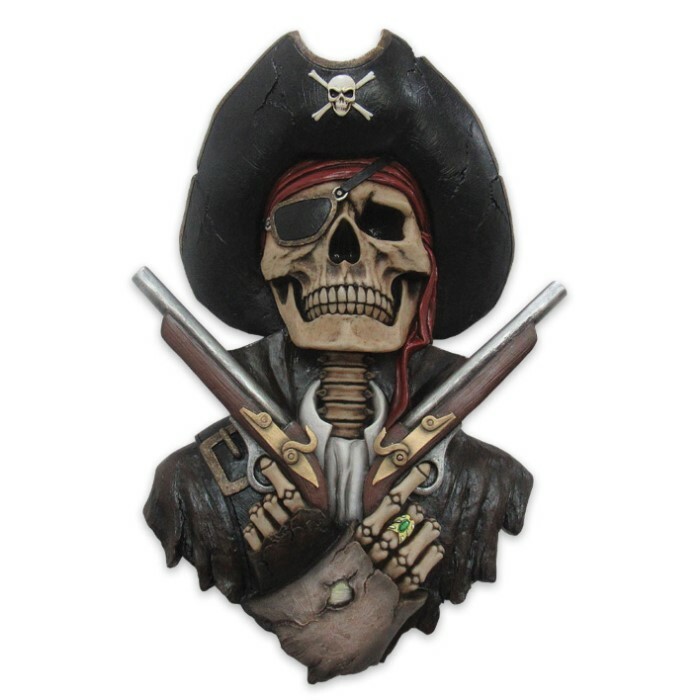 The "Dead Men Tell No Tales" wall hanger is molded from tough cold cast resin and painstakingly hand painted to accentuate the myriad fine details and authentic touches. At 16" high, it's impressively sized and sure to draw attention and praise from all who see it. Mount it on the wall of your man cave, bar, hobby room, living room, studio, office or practically anywhere else. It's easy with the included mounting hardware and instructions. This unique piece of swashbuckling buccaneer art also makes a fantastic gift for pirate enthusiasts, colonial Caribbean history buffs, rebels of all stripes or anyone who simply appreciates fine craftsmanship and vibrant home/office decor.